Is the Retail Supply Chain Diluting Your Brand? Creating a cohesive brand identity is one of the most challenging requirements of retail. It also happens to be one of the most important. Successful branding creates a relationship with consumers, which is the key to conversion and growth. Unfortunately, even if a brand does everything right internally to facilitates a connection with consumers, it becomes ineffective if your strategic identity is diluted before it reaches your intended audience. Getting a product to a retailer's shelf, either physical or virtual, requires a high level of internal and external collaboration, and every time product information exchanges hands there's potential for dilution of the brand. Before any collaboration with third party retailers, there's a high-level of internal collaboration. The product development team, the marketing team, and the creative team work together to make sure that that the notable features of the physical design are highlighted in the creative assets (photos, packaging, design), and the marketing collateral (product descriptions, features, and benefits). Once this process is complete, the branded finished product is ready for retailers. 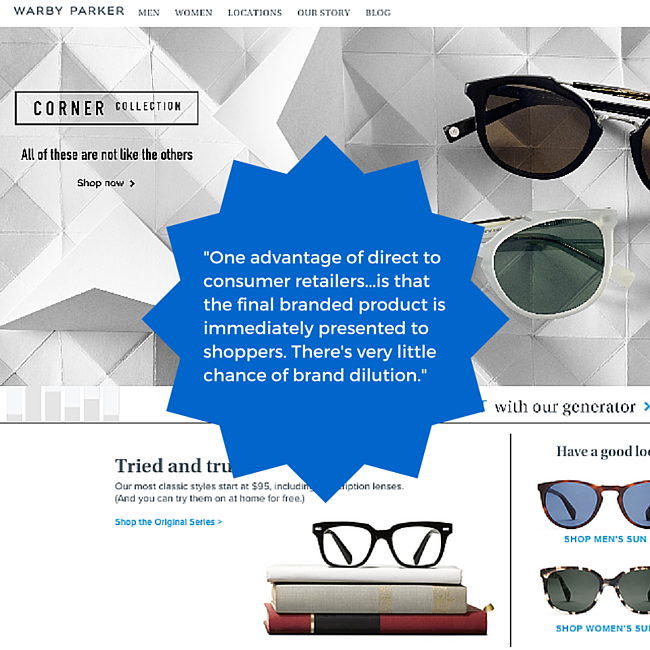 One advantage of direct to consumer retailers, like Everlane or Warby Parker, is that the final branded product is immediately presented to consumers. There's very little chance of brand dilution. This is also why so many young brands choose to sell through their own eCommerce platform before seeking distribution at major retailers. Even so, selling through third party retailers is desirable because it gives brands the opportunity to reach new consumers and grow their audience. Unfortunately, this is also where the majority of brand dilution can occur.The cause of brand dilution is not a conscious act on the part of retailers; it's a natural progression. Diluting their suppliers' brand is not a conscious act on the part of retailers; it's a natural progression caused by the difference in their day to day priorities. 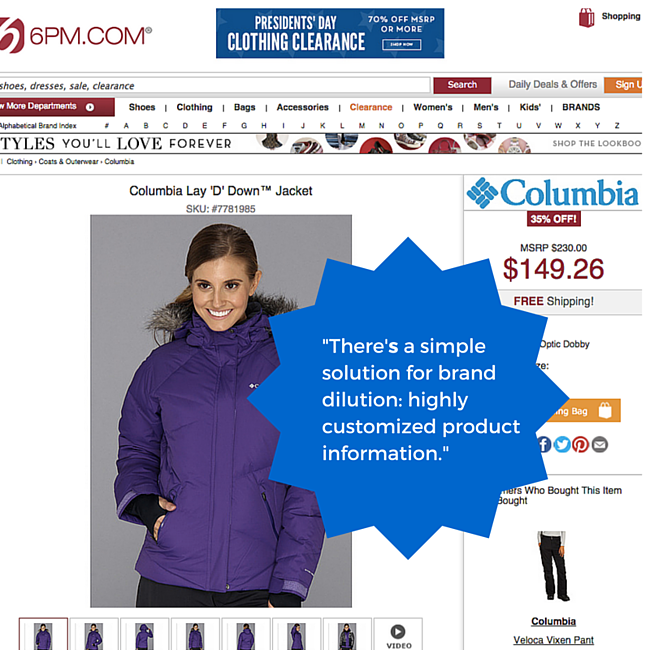 Columbia Sportswear has their own eCommerce site and is also sold at retailers like Kohls. Columbia's eCommerce team can focus on strategies that will benefit the Columbia brand and make their products to stand out. 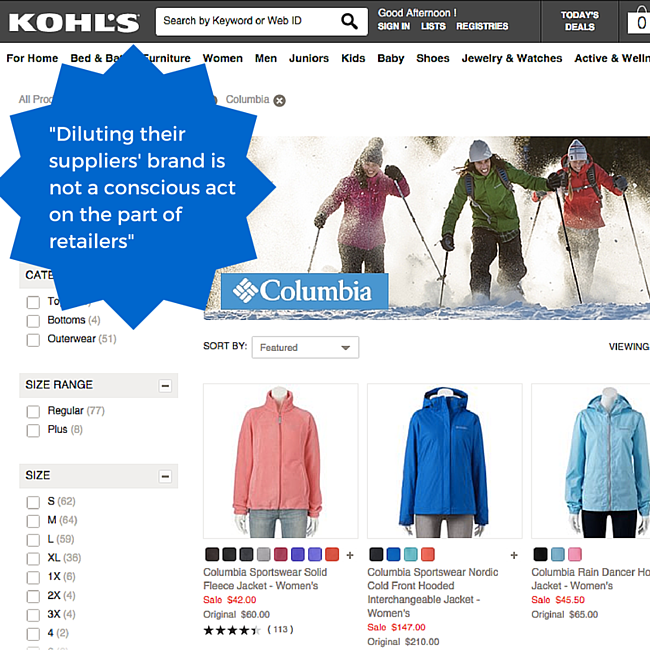 For the eCommerce teams at Kohl's, the "Kohls Brand" will always come before the needs of the individual brands they sell. Creating cohesion across categories requires uniformity in the way products are formatted, which leaves less room for each individual brand's identity on their product page and can impact consumers' purchase decisions. 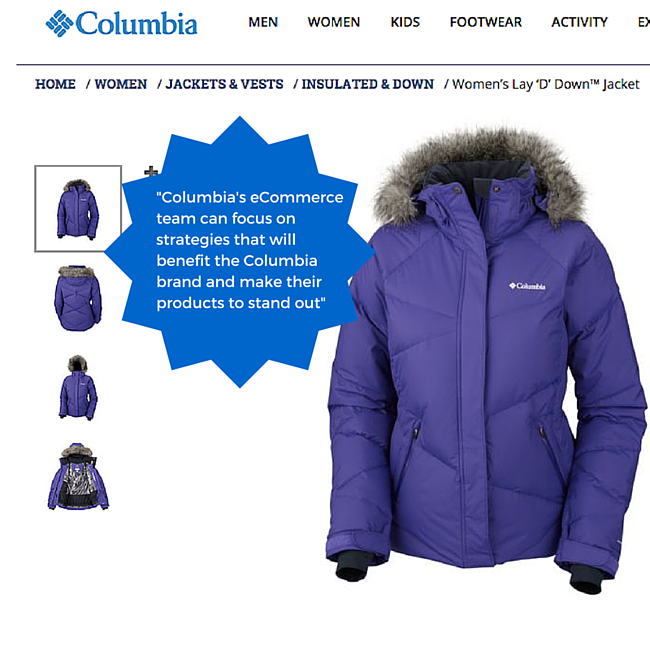 Let's compare the way Columbia's Lay “D” Down Jacket is presented to consumers on their own website and the way it's presented by 6 PM, a third party online-only retailer. On Columbia's website, the jacket is accompanied by detailed product information and a video that explains how their unique omni-heat thermal reflective layer works to keep the wearer warm. 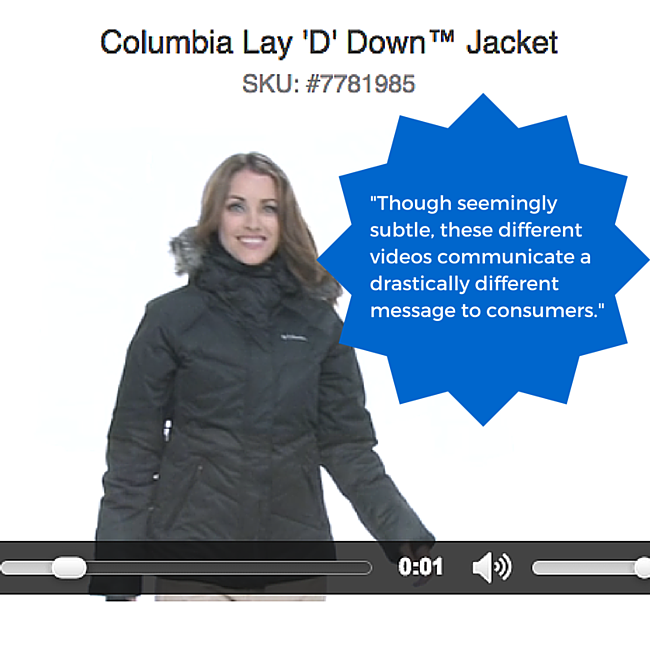 On 6 PM's website they have nearly identical written product information, likely supplied by Columbia's sales team, but there's one major difference: instead of a video explaining the Omni heat thermal technology, there's a video clip of a model walking into the frame, doing a few spins to show the jacket from every angle, and walking out of the frame once more. Though seemingly subtle, these different videos communicate a drastically different message to consumers. The video on Columbia's website was created internally for consumers to explain the performance value of Columbia's heat technology. This subconsciously communicates that Columbia values performance and function which is a smart brand identity for a performance apparel company. The video 6 PM has included is more relevant to their brand identity as an eCommerce retailer offering consumers a wide selection of apparel, shoes, and accessories from popular brands. A video explaining how omni-heat works would be out of sync with the rest of their assortment. Instead, they've put the focus on the jacket's visual appeal to connect with shoppers that are primarily concerned with style and fashion, not performance. Because the Columbia brand places emphasis and value on performance, it dilutes Columbia's brand identity, however minimally. As always, understanding the problem is only useful if there's an easy way to fix it. Luckily, there's a somewhat simple answer to brand dilution: highly customized product information. In this case, Columbia has already provided 6 PM with the type of highly detailed product information that's crucial to conversion. This includes a detail that stating "Omni-Heat® thermal reflective lining boosts your body's heat retention." What's missing is an explanation of how omni-heat technology works. Columbia can't include their omni-heat video on 6PM's website, but they can provide the eCommerce site with customized product information that includes a written description of omni-heat technology in order to offset the lack of an explanatory video. Creating customized product information for all of your retail partners might seem like anything but simple, and if you're still emailing excel spreadsheets it's easy to become overwhelmed by the idea of manually editing every single one. That's why more and more companies across the retail supply chain are adopting new ways to exchange information that don't require manual updates. Salsify, for example, allows suppliers to house all of their product information in a central repository on the cloud so it's easy to update specific facets of product information in order to customize it for each retailer.